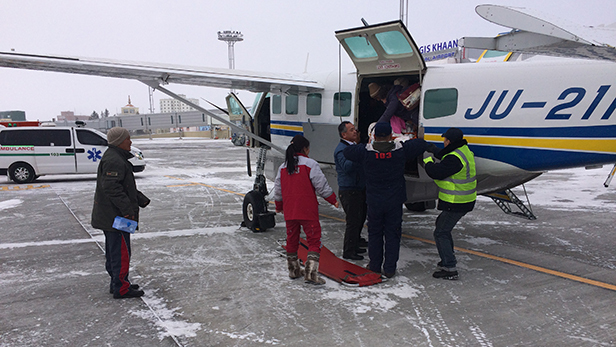 MAF Pilot Roy Rissanen shares some fascinating insights into cold weather operations in Mongolia. Here are ten fascinating facts about flying when the temperatures plunge well below zero. The average household freezer runs at -18 degrees Celsius. In Mongolia, during winter, that’s a warm day! 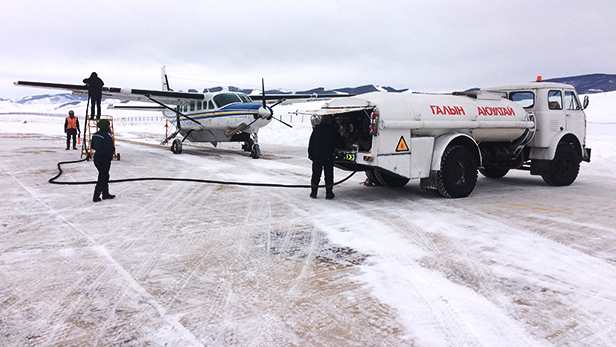 If you’ve ever wondered how we keep flying when temperatures plummet well below zero, let MAF pilot Roy Rissanen explain. It gets pretty cold in Mongolia at this time of year. What’s that like? 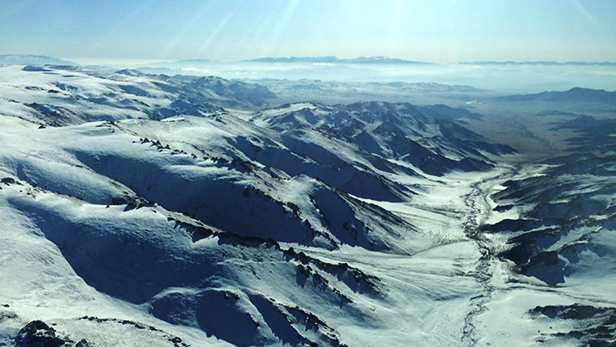 The lowest ever recorded temperature in Mongolia was -55C. Research conducted over the past 33 years suggests Mongolia is one of the countries where the climate has changed the most. Winters have become warmer and climate is drier. This winter, we hardly have any snow around Ulaanbaatar. The winter has been reasonably mild. How do you cope being outside all day? The hardest thing in cold weather is hanging around at airports with the airplane waiting to depart. It can be windy and the temperatures are very low in the morning before the sun comes up. You have to dress for comfort and to prevent frostbite. When fully dressed up, movements can be a bit restricted. With your hood up over your head, vision is limited to forward only. Simple, ordinary tasks are a challenge in the cold? Pens stop working, drinking water is frozen in the bottle and your mobile phone battery dies and the phone shuts down after a few minutes in the extreme temperatures. These are some of the practical details you have to consider when you’re exposed to very cold weather. In Ulaanbaatar, a worse problem than cold is the winter pollution caused by smoke, which often reduces the visibility and prevents us and others from flying. And you have orange covers that you use on overnight trips and location where the plane can’t be hangared? 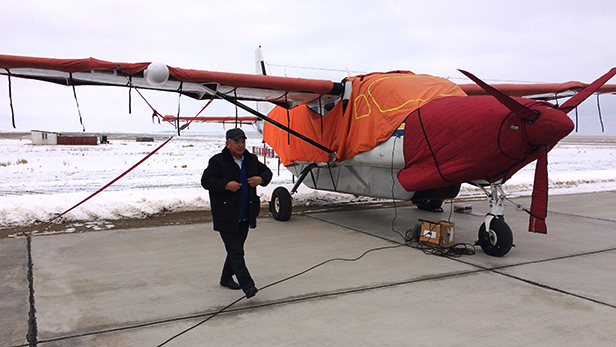 We put covers over wings, tail, fuselage, and windscreen to prevent them from collecting snow, frost and ice. 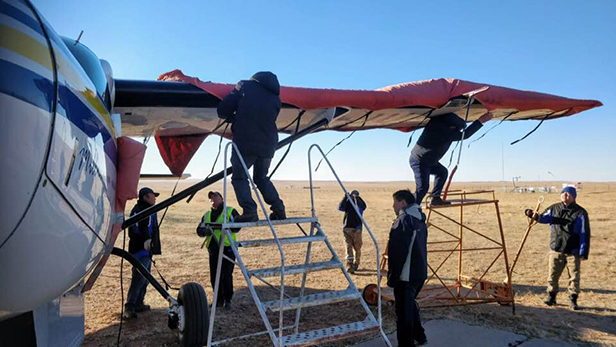 It’s quite a job to put the covers on when it’s windy, especially over the wings and fuselage. We have to find a ladder or elevated platform to stand on. Usually, we get some assistance from airfield personnel. It takes around 30 minutes to put the covers on and 15 minutes to take them off. It’s important to be extra careful not to damage sensitive parts, such as antennas and static wick dischargers. Often the covers get wet and they need to be taken out and spread out to dry when the airplane gets back to base. Winter flying takes a lot of extra time and effort. It’s quite hard work! 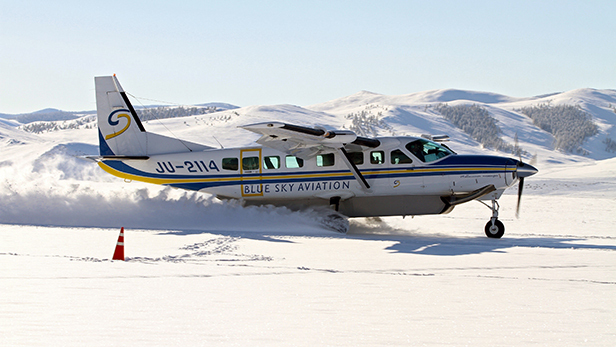 What are some of the things you have to know to fly in sub-zero temperatures? 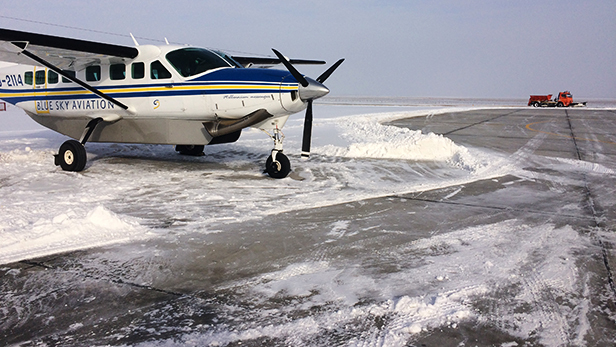 First, the biggest concern in flying is aircraft icing, which we need to avoid as much as possible. We also need to know what to do if we get signs of any icing. Icing needs to be taken into consideration for all phases of the flight, from planning and pre-flight to shut-down, and post-flight actions. Second, we need to plan for stopovers and night stops carefully. Do we have all the necessary equipment on board and is it functioning? We carry about 40kg extra equipment during cold months. Are we sure about having electricity available so that we can run the heaters and get the aircraft started again? Third, are we reasonably assured that passengers can cope with cold conditions if we encounter any delays, alternate routings or emergencies? The biggest problem is on how to manage and survive the cold. How are pilots trained to fly in cold and adverse weather conditions? We all complete a training course on the theory of cold weather flying which is repeated once a year. 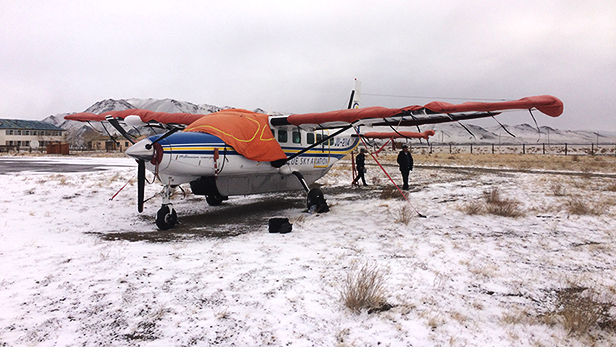 Before we started operations in Mongolia, MAF arranged for us to visit a Canadian Caravan operator to learn how they operate in cold conditions. I went to Canada in 1999 for 10 days to learn about the procedures and equipment they use. That was a very good learning opportunity. Are there places you can’t land in winter? 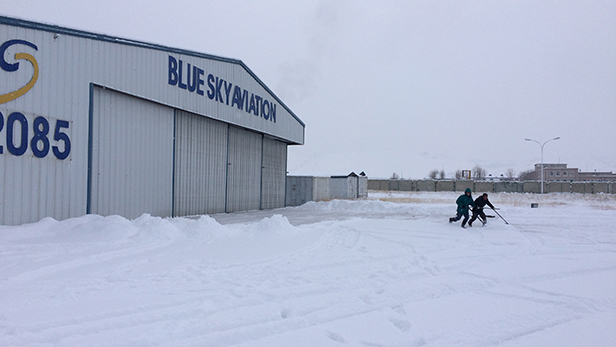 All temporary airstrips that get covered with snow become unusable during the winter months unless there are people and equipment to keep the airstrips clean. What are the roads like? Are there lots of road accidents – is safer to fly or drive? Mongolians don’t generally like moving around in winter months because it is both difficult and dangerous. Mongolian countryside is very sparsely populated. Any vehicle breakdown or road blocked by snow means imminent danger. Every winter there are people travelling who freeze to death when unable to cope with all kinds of problems on the road. Flying is definitely the safer option. Are there any memorable winter flights that Spring to mind? One memorable experience happened back in the year 2000, when I travelled with my Mongolian language instructor to Ulaangom with MIAT airline, on an old AN-24 airplane. After surveying old airstrips for eight days around the countryside in a Russian Jeep, it was time to fly back to Ulaanbaatar. I had a return ticket, but they unexpectedly closed the airport and there was no flight for the next three weeks. We took a 1500 km ride back to Ulaanbaatar in a Russian Jeep. It was May but still we got stuck in a severe snowstorm when crossing the mountains near Tosontsengel. All the vehicles got stuck on a narrow track. In a short period of time we were deluged by about 40 cm of snow forcing us to abandon the vehicle and seek shelter in a nearby ger (yurt). There were a lot of people packed in and we were all sleeping on the floor, thankful to have found a shelter. A resident offered us a cup of hot milky tea. After a few hours, early in the morning when still dark, we managed to continue the journey and drove straight to Ulaanbaatar. The whole driving excursion took 36 hours non-stop with two drivers. That experience taught me to respect Mongolian weather and resourcefulness of Mongolian people! Story and photos by Roy Rissanen. (Additional image by Dallas Derksen).